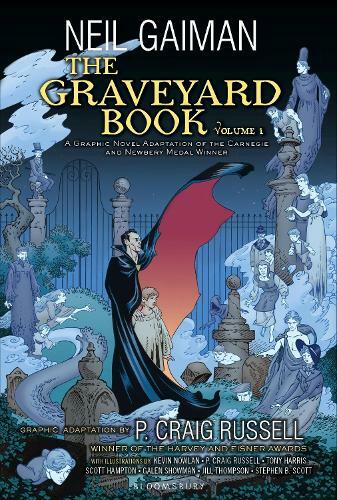 An irresistibly-brilliant graphic novel adaptation of The Graveyard Book by Neil Gaiman, adapted by award-winning illustrator P. Craig Russell. This is the first of two volumes. Nobody Owens, known as Bod, is a normal boy. He would be completely normal if he didn't live in a graveyard, being raised by ghosts, with a guardian who belongs to neither the world of the living nor the dead. There are dangers and adventures for Bod in the graveyard. But it's in the land of the living that the real danger lurks, for it is there that the man Jack lives, and he has already killed Bod's family. Each chapter is illustrated by a different artist, with contributions from P. Craig Russell, Kevin Nowlan, Tony Harris and Scott Hamptom, Galen Showman, Jill Thompson and Stephen B. Scott. Neil Gaiman is amongst Britain’s foremost writers of fantasy and graphic novels; blending mythologies, folklore and urban legend in a diverse portfolio that embraces the ground-breaking graphic novel series The Sandman, contemporary children’s classics, The Graveyard Book and Coraline and adult fiction including Stardust, Neverwhere and the masterpiece that is American Gods.